The glyphs look awesome, but I couldn’t begin to identify which is which. looks awesome guys. 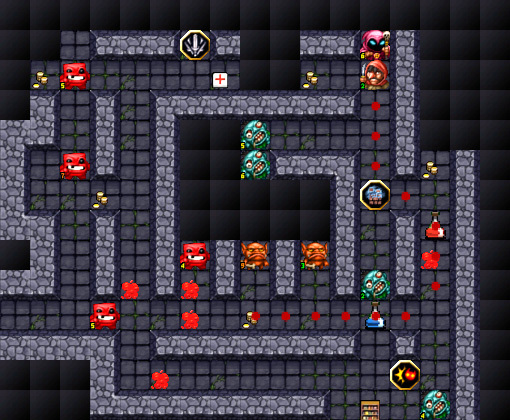 Though the borders of the wall sprites give away the tiles you can not reach yet. It changes the game! Probably in a good way! Keep it up guys! Can’t wait! @Thimon Like the image caption says, the new tilesets give players a bit more information 😉 It’s totally on purpose. New artwork looks fantastic. Can’t wait for the full version. Looks GREAT! This can’t come out fast enough. Was happy to read about the new town information in the Rock, Paper, Shotgun interview. I hope though that unlocking things in town isn’t based purely on gold. I really liked how in the current version you had to use all the different classes to unlock all the advantages. It gave a real incentive to do more then just play with the strongest class which added a ton to the replay value. We haven’t released the new version yet, we only had a playable test up at the GDC. I have to say, I’m not a big fan of this art style. It’s nothing against the artist, I just don’t really care much for the Plants vs. Zombies, Angry Birds-type trend of cartoonishness and exaggerated features in indie games. I know you’re angling for the mainstream phone market but I hope you retain the 8-bit style as an option for the PC at least. Other than the Meat Man, these guys are not conveying the same message that the 8-bit sprites did. The Goblin looks miserable, not roguishly sinister (but in a minion sort of way); the Warlock is sinister, but way too subdued compared to the fire-in-hands cackling madness of his 8-bit incarnation. The Zombie…is it a floating head now? I can’t make out a body at all. To me, one of the best things about the free version’s art style is that it manages to suggest so much with so little, as well as its over-the-top caricaturing of stereotypical fantasy villains. This new style loses a lot of the expressiveness of the old, as well as its over-the-top nature. That being said, I’m still looking forward to the new version for the gameplay overhauls, though I hope this screenshot is just of part of a map; it’s very small if it’s a full dungeon.